Two billion light years away, two clusters of galaxies are colliding in an intergalactic pileup. As black holes interact with the gas inside the collision, the mass has turned into an enormous particle launcher, spewing some of the universe’s highest-energy stuff. The picture above shows a couple of different processes happening at the same time to create the intergalactic bazooka. 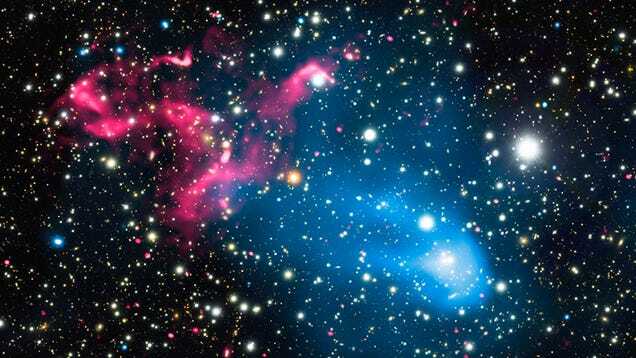 The blue section, taken by the NASA’s Chandra X-ray Observatory orbiting the Earth, shows X-ray emissions from colliding galactic clusters, the largest structures in the universe bound by gravity, each a quadrillion times heavier than the sun, according to a Chandra press release. The fuzz shows hot gas that fills each cluster, and the collision causes particles to travel faster than the gas traveling at the speed of sound —already much higher than the speed of sound on Earth because of its high heat. This creates shock waves, kind of like the ones that come off fighter jets. The red section, taken by the Giant Metrewave Radio Telescope array in India, shows radio wave emissions from the supermassive black holes at the center of galaxies that appear as the bright pink blobs. The fun happens when the black holes and the hot gas interact. Scientists already knew that supermassive black holes accelerate the particles out of the cloud that orbits them, but when those accelerated particles meet the shock wave, they’re boosted again as if they passed through one of those foam Hot Wheels turbochargers. The scientists showed the results at the 229th meeting of the American Astronomical Society in Grapevine, TX and published these observations in the inaugural issue of Nature Astronomy Wednesday. Having a giant space accelerator means that there could be unobserved particles created in space, the same way scientists needed the high energy of the world’s largest particle accelerator, the Large Hadron Collider, to observe the Higgs Boson. “Potentially these accelerators can reach energies much higher than the LHC, maybe a million times more,” said van Weeren.